Get organised so you can get away quicker. How can you make your camping get away easier and quicker? Many practiced campers will have a camping box or chuck box to keep all their camping gear stored ready for your weekend or trip away. Using a camping chuck box means all you need to do is go grocery food shopping, then pack your tent, camping boxes and food into the car / truck and away you go. No longer do you need to spend hours searching the house / garage for the stove, camping pans, sleeping gear, it’s all stored in you chuck box ready to go. Camping boxes come in a variety of sizes, shapes and materials. The cheapest option is a plastic tub, these have many benefits including being partially waterproof, easy to lift / stack and if it’s clear plastic you can easily view most contents. Make sure they aren’t too large, you want to be able to easily pick up the box and not strain your back. Also don’t go too small then you won’t be able to fit large items such as a camping stove, cooking equipment or some large pans. Check out Walmart and your local hardware store as your should be able to pick one of these up for as little as $10. Good: Affordable (approx.$10 to 40), stackable, light weight. Bad: Can damage easily if dropped, not completely waterproof, can be hard to find what you’re looking for if it’s at the bottom. The next cheapest camping box option, much stronger than a plastic tub but probably not clear for easy viewing of contents. Some of these include wheels which make moving around easier. Good: Still affordable (approx.$40), reasonably strong, stackable, light weight, almost completely waterproof. Bad: Once again can be hard to find what you’re looking for if it’s at the bottom. There are purpose built boxes from a company such as camping-boxes.com, based in Arizona this company has been around for over 15 years and makes good quality camping storage chuck boxes. 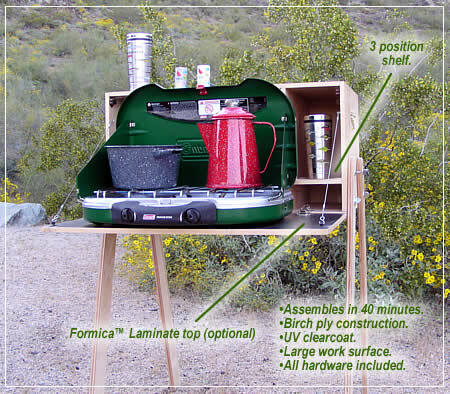 Their more expensive models come with legs so you can use your chuck box as a portable camp kitchen / work surface. These are great if you camp all the time and are away for days or even weeks on end, they are then worth the extra effort to carry and setup. If you have some spare time and like building stuff, then there are chuck box plans available on the net to make your own camping box which will bring the price down. Good: Very functional when setup, quick access, great as a work surface and cooking table. My preferred option is to use the plastic tubs along side a decent compact camping table, you can place your cooking stove on the table, not quite as functional as a full purpose built camp kitchen chuck box but a lot lighter and cheaper. At the end of the day what you are trying to achieve is to make camping easier, so you can get away more often with less hassle, enjoy your trip!